The city is loving our latest addition to our professional sports team; namely the Toronto FC playing at a great new stadium; BMO field. The Toronto FC are part of the MLS, or Major League Soccer, the premier soccer league in North America! We have great Toronto FC tickets for all games at BMO field, which is a great raucous experience, and one not to be missed. Bring a blanket if it’s cold or a raincoat if it’s pouring, because nothing stops the loyal fans from getting full use of their Toronto FC ticket experience! We can also source tickets for any MLS experience in North America, and pass the tickets on to you in Canadian dollars too! 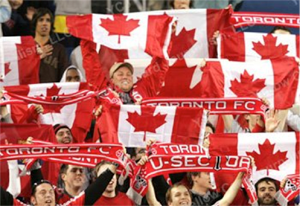 Toronto has a great history of supporting their professional sporting teams, and with such a vibrant, multi-cultural mosaic, the Toronto FC have proven to be a big hit in our great city!